Share the post "Cancer risk with a common surgery? Part 2"
If you missed part 1 of this series you can watch it here—Fibroid morcellation: Cancer risk part 1. Pat: I have been talking to Dr. Bruce McLucas who is the founder here of the Fibroid Treatment Collective in Beverly Hills about fibroids, about some of the options for treatment, and about some disturbing news stories we have been reading recently about an instrument, I believe it’s called a power morcellator, that people are saying might spread cancer during fibroid surgeries. It’s good to see you again Dr. McLucas. Bruce: The story really got “legs” and it started being circulated back early in this year, in 2014. A younger woman had a hysterectomy using the morcellator for fibroids. It turns out, when they examined the tissue after the laparoscopic procedure using the morcellator, there was some cancerous cells in the tissue. Now her contention is that, because those bits of tissues were morsels taken out of the bigger tissue, it is divided up as you remove the tissue, that her chance of surving this terrible disease was diminished a great deal. That really brought the next step that was a Food and Drug Administration hearing. Pat: So now what is the Food and Drug Administration saying and/or doing about this? Bruce: This was recently in the news. The Food and Drug Administration, we’ll just call it the FDA, convened a group of interested people, both gynecologists like me, members of the public, and manufacturers who make the instrument. Number one, the FDA asked for more study from a larger group to see how likely a woman would be at risk, and they requested a warning to be placed on the morcellators that are still being sold, saying that there is a small chance that cancer could be spread. And then more so, they asked all of us, as gynecolgoists, to have a consent from our patients that says we have discussed the small possibility that we could be dealing with a cancer when we think we are dealing with a benign tumor. Pat: Now at the Fibroid Treatment Collective, the way that you treat fibroids primarily really is through a process called embolization. Are these morcellators used in that process at all? Bruce: Not at all. We don’t break up the tissue, we keep the uterus in tact, we starve the fibroids by removing their blood supply. Should fibroid embolization not work especially in a woman with menopause, we will know it within two weeks, and we will be able to help that woman pinpoint the chance that it may be that rare cancer. Pat: Now this device itself, is this, in your professional opinion, an isolated incident? Bruce: I think were all going to learn out of this experience, the morcellator is just a tool. Now unfortunately Pat, we don’t know there is no imaging test, no blood test, there is no biopsy that can say to us you do not have a cancer. It’s only the odds. Pat: Right you can look at certain risk factors we talked about before, and most of them have to do with women being menopausal. Bruce: In the menopause, not taking estrogen, then a rapidly growing uterus would be a real concern. But in general if we can take that morcellator out of the equation like we do in fibroid embolization, we don’t use scalpels, it’s not a surgery, it’s an outpatient procedure that leaves the uterus in tact and works for more than 90% of our patients. We have done more than 10,000 women at the Fibroid Treatment Collective. Well over 90% of those people have successful outcomes. Pat: And I have heard you explain how that process works, and it makes sense to me when you talked about actually starving the fibroids. Bruce: The fibroids, like every bit of tissue in our body, gets oxygen from the red blood cells that the arteries bring down to that tissue. Once we block that artery, which is what we do in fibroid embolization, there’s no blood, there’s no oxygen, and the fibroids shrink. Now the uterus has another blood supply, so the uterus is fine. A lot of our patients have had children after this procedure. It’s fine. Pregnancies are great. Pat: Now we talk about menopausal women, but also there are a lot of young women having this issue as well aren’t there? Bruce: A lot more young women, a lot of women in their 20s, a lot of women who know that if they had a myomectomy the fibroids would come back again. After embolization they are gone forever. 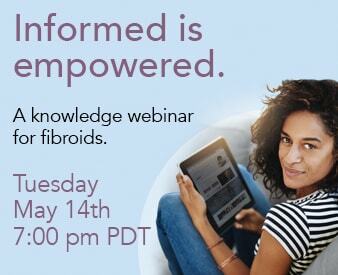 Pat: I know people have a lot of questions about these issues and I know one of the things that you do at the Fibroid Treatment Collective is have seminars where people can actually come out and have some of those questions answered. I would imagine that people are asking a lot more about the morcellator as it hits the news. Bruce: After the FDA conference some of the response was very rapid from manufacturing. A company called Johnson & Johnson has stopped making the morcellator and they’ve recalled all the morcellators that they’ve made. So that’s one thing. One of the big insurance companies out east has decided that they are not going to pay for any surgeries that use the morcellator. Pat: Fortunately that is not going to be an issue with anyone who chooses embolization as a way to deal with the issue of fibroids. Bruce: Embolization is celebrating its 20th anniversary and millions of women throughout the world have had this procedure now, and safely so. Pat: We’ll continue this discussion, thank you for watching.